"I want to say a big thank you. My eating, sleep and general well being has improved so much." (Man 40+ with low mood and anxiety). Life is for living, not just for breathing. Do you need effective, practical help now? Your health, family, work, education and relationships. When life gets complicated and things need to change. 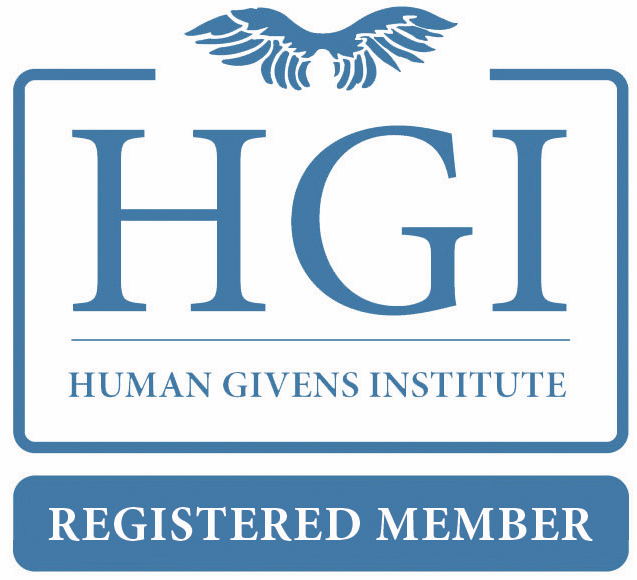 I use the Human Givens (https://www.hgi.org.uk/) approach to Hypnotherapy - a highly effective combination of talking therapy and guided imagery, the best of both worlds. People come to see me when they want help with difficulties such as depression, anxiety, fear, panic attacks, trauma (including birth trauma), phobias, distress, sadness, bullying, addictions, eating disorders and relationships. As a human givens therapist I discuss with you, in detail from the first session, how you want your life to be. Sometimes we can become so entrenched or confused that we can't see the wood for the trees. There won't be endless discussions about your past, though I will help you remember and use your strengths and abilities that you may have lost touch with. However, if we establish that old traumas or phobias are holding you back we can swiftly and comfortably neutralise them using the rewind technique. I can help you learn new ways of thinking and perhaps teach you different tools to deal with situations. We can work together to come up with a plan of what changes you need to make at a pace that suits you. This is an important part of the work we do. There's no point in endless talking in the therapy room, things need to change out in the real world and this is why I will often ask you to do some agreed manageable task/s between sessions. The additional useful tool is guided imagery (visualisation) to help you imagine and rehearse how you want things to be. By practicing a new or wished for behaviour in this way the brain has a go at the behaviour in advance. This has been shown to prime the brain for success, so making it easier for you when you do it for real. This therapy can help you change how you think, feel and act so you can feel better and move forward in your life. This brief, solution-focused therapy helps you feel better quicker and saves you time and money as you won't have months or years of weekly therapy. Ignored the problem and suddenly it has reached a tipping point? Got a sense that things aren't right and want to nip it in the bud? Tried lots of other avenues and still find yourself stuck? Talked and thought endlessly about it? Become worn out, sad and fed up? Tried a variety of medications? And yet haven't made the progress you want? If any of this sounds like you, I'd like to help. I use on-going outcome measurements to show progress and these demonstrate that, even if a client has had difficulties for a long time, they can often make significant progress in 4 to 6 sessions. Some may only need a couple and some with more complicated situations may need more. Get in touch by phone, text or email, now. Take that first step to getting the real you back, today. On outskirts of Maidenhead. Easily accessible from Berks & Bucks using A404, M4 and A4 for Marlow, High Wycombe, Beaconsfield, Windsor, Slough, Bracknell, Wokingham and Reading. Free parking at the GP surgery. I offer effective, brief, practical therapy that can help you begin to feel better from the first session. In combination with my life experience, which has included being a qualified staff nurse, a mother and experiencing some challenging personal circumstances it has made me passionate that, no matter how difficult life becomes, positive change is possible. So whether you have such problems as stresses at home with family, illness, abuse, violence, anger, bereavement, divorce, separation, loneliness or betrayal or problems at work with bullying, lack of direction, wanting a change, too much change too fast, trouble with the boss or with colleagues, then get in touch and begin to take back control. "Amanda was immediately warm, welcoming and put me at ease, I was able to trust, be open whilst feel completely comfortable during our sessions, which was of the upmost importance to me. I cannot thank her enough for helping me progress and succeed. My life & well being has improved drastically from our sessions and I will be able to continue to implement what I have learnt moving forward as a confident individual. Thank you again!" "I want to say a big thank you. My eating, sleep and general well being has improved so much." "Following a horrific car crash, I was unable to even get back into a car. A friend told me about what Amanda does and highly recommended her as a therapist. Amanda had worked wonders for her following a break up. I read through her website and decided to call for advice. Amanda clearly explained what she offered and I booked in for a rewind session. I was apprehensive but Amanda fully explained everything and made me feel comfortable and at ease. The experience has changed my life and I am now able to drive again without having panic attacks or any anxiety. Amanda has really changed my life and I would highly recommend her and have already referred people for a variety of reasons. Amanda is a true professional and excels in her field." "Amanda is easy to talk to , even on sensitive issues , I would recommend her to anyone and if I need therapy again I will definitely be confident to use her again." "I visited Amanda to help me with a phobia of swans. I wasn't sure whether therapy would help but I'd had enough of being scared that I may come across a swan when I was out walking with my dog. Even after the sessions I wasn't sure it had worked, as you don't meet a swan every day! However some weeks later when out walking with the dog, we came across one and I found I no longer needed to run away, in fact I was fairly relaxed. I was amazed what a relief. My family and I are really pleased that I can go out and about quite freely again. I hadn't realised how many places I avoided because of my fear. I would recommend seeing Amanda if you need help with a phobia as it was very straight forward and she dealt with it in a way that allowed me to stay calm throughout." My aim is to help you in as few sessions as possible. At a pace that suits your budget, there is never any obligation to book another session. I work from a local GP surgery with plenty of parking. Remember that by using effective brief therapy you won't need months or years of weekly therapy, saving you time and money. Research shows that more than 3 in 4 clients were either symptom free or significantly recovered in an average of only 3.6 sessions; and that Human Givens therapy is 3 times more effective than the next most effective psychotherapy. (Research published in: Psychology and Psychotherapy: Theory, Research & Practice). I am registered to work with PTSD Resolution, a charity that helps war veterans recover from trauma. This charity uses only uses Human Givens therapists to help the veterans with trauma, as they have found that they techniques these therapists use are the most effective way of affecting a rapid improvement, in a comfortable way. I'm interested in helping all sorts of people, with lots of different difficulties that are causing them distress. I strive to stay up-to-date with the most effective psychological techniques available, so I can help each individual client, with their unique story, make progress fast. If you want to start living life, rather than just reliving it, call, text or email me now.